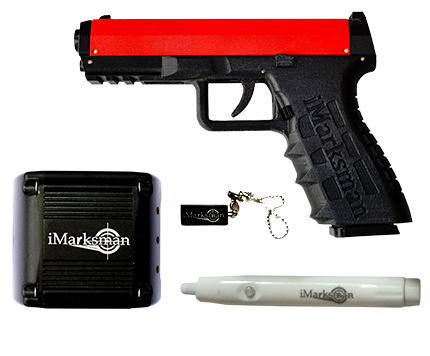 The iMarksman® system helps to train Law Enforcement officers, military, and security personal making decisions on when to shoot and how long to shoot for to eliminate a threat. iMarksman® systems for Military and Police are a efficient way to train students and improve professionals’ skills using your system everywhere – at home, in a classroom or even in a hotel room. You will be able to interact with different types of targets as well as create your own training environments. Different scripts and scenarios will not allow you to create a habit and always will keep you involved and tensed. Use your own real firearm or training guns. Portable easy to transport to different locations. Police agencies ranging from federal, state, city and county law enforcement, with established standards for handgun qualification courses. This standard qualification is intended to be a basic measurement of the officer’s shooting skill. With the iMarksman® Firearm Qualification Course, the firearm instructor will be able to convert any classroom in your administrative building into a firearm simulator class. With iMarksmanship Mode, the trainee will be able to refine the quality of their trigger pull and improve accuracy as well as holster-drawing techniques. Script Mode allows you to select backgrounds and a set of plain or live targets. The instructor will be able to make these targets “move” towards or away from you and the live targets will talk to you. Each target has a ‘hitting area’, which can be programmed to take a particular number of shots before the target goes down. The number of shots for the trainee can be programmed as well. Random Mode allows you to select backgrounds and set of targets. The targets will appear randomly (position, different size and time frame). You can always review the history of the shots to see shot placement, the timing between the shots, and gun movement during the shooting. With Manual Mode, you will be able to select backgrounds and a set of targets. The firearm instructor will be able to control the target’s position and time frame. You will be able to review the history of shots, to see shot placement, the timing between the shots, and gun movement during the training session. Video Mode you convert a regular video into a video scenario without any editing. Simply copy and paste it into the iMarksman® Video Target folder. You can also take a video from a dashboard camera in a patrol car and use it as a video scenario. The video will stop after the first shot is taken and will show the pattern of the following shots. Similar to Video Mode, Branching Video Mode allows you convert a regular video into a video scenario without any editing. Simply copy and paste it into the iMarksman® Video Target folder. You can also take a video from a dashboard camera in a patrol car and use it as a video scenario. The video will continue until the end, then the shot history window will show the shot placement and timing. Choose the best option to train Police officers and Military personal!